“A bunch of eggs become compacted in there, creating a mass that acts like a large tumor,” says Jennifer Graham, a board-certified avian veterinarian at the Foster Hospital. It makes it hard for chickens to breathe because they don’t have a diaphragm—the muscle and tendon that separate the chest from the abdominal cavity—and so the impacted eggs crush the lungs. In Emily’s case, the eggs had caused her oviduct to become so swollen that she developed a tear in the muscle of her abdominal wall. Infection and blood loss would kill her unless veterinarians moved quickly to fix the damage and stop the internal egg laying. Small-animal surgeon Rob McCarthy, V83, repaired Emily’s abdomen and spayed her. Unlike spaying a cat or dog, “it’s difficult to remove the ovary completely because it’s right on top of the aorta,” the largest artery in the body, Graham says. Instead, veterinarians remove as much of the ovary as possible, along with the oviduct, which produces every part of the egg but the yolk, so the bird can’t lay any more eggs. A year after her ordeal, Emily is thriving. “Her recovery was phenomenal, immediate and amazing,” Martin says. 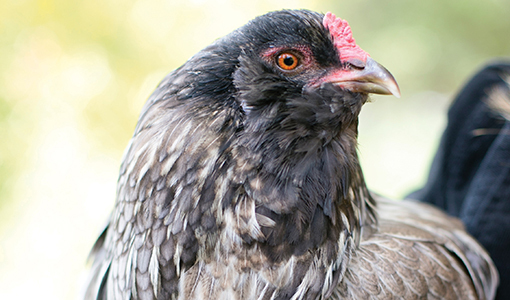 The hen has resumed her standing at the top of the pecking order in her free-range flock in Clinton, Massachusetts. “She’s one tough old bird,” notes Martin.